Once upon a time, I commented quite innocently and to all assembled, that a woman visitor in our home had a mustache. (As I recall, it wasn't a big groomed walrus affair or handlebar or Fu Manchu or anything like that; it was just a bit of fuzz that she had neglected to get rid of.) Whatever it was, there was an embarrassed silence. Later, I was duly reminded by Mommy that it was impolite to comment on "such things." I thus grew in wisdom and in stature into a typical politically correct member of my generation, bred not to comment on "such things" as the physical oddities or deformities of others. I learned well, since even today, as I have commented elsewhere, I am still taken aback by the local Neapolitan habit of referring to someone as "ugly," as in, "Oh, you mean that ugly guy over there?" as if you were saying nothing more than, "Oh, you mean that tall guy over there?" There is an entire literature dedicated to our fascination with — and I am so well trained that it is uncomfortable for me even to write this word —"freaks." Indeed, when they used to have real circuses and carnivals, the "freak show" was very popular. This was not just a vulgar fascination, either, not something you just threw out to ignorant yokels 'cuz they didn't know no better than to stare at freaks. Some of the greatest names in Western art have drawn and painted the grotesque. 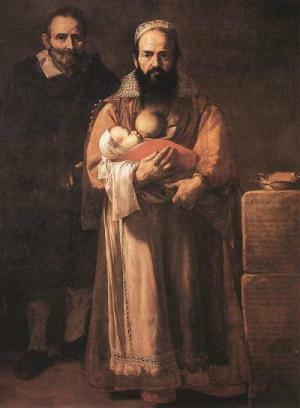 Leonardo, Velasquez, Rubens and de Ribera all invited you to step right up and see the dwarf, the monkey boy, and the bearded lady (de Ribera's painting, right). The title of this painting is simply Bearded Woman and is from the year 1631. The painting is now in the permanent collection of the Museo de Tavera in Toledo. The subjects were husband and wife, Felix and Magdalena Ventura. Even before the painting, Magdalena Ventura was famous. She was not really from Naples, but rather from somewhere in the nearby Abruzzi. She was already a grown woman with several children before her beard started to grow in thick and full like a man's beard. When the Duke of Alcala, the Spanish viceroy of Naples at the time, heard about her, he invited her to come into the big city and sit for a painting by de Ribera, the Duke's own court artist and one of the leading painters of the time. Magdalena's fame spread such that she was mentioned in court correspondence throughout Italy, reflecting perhaps all of our lasting fascination with weirdness. The Duke and his quack medicos certainly weren't up on such things as androgen excess or perhaps the rare genetic disorder known as hypertrichosis; they just thought, Holy Cow, a bearded lady. (I think the expression "Holy Cow" comes into English from India; it doesn't exist in Italian or Spanish, so the Duke probably said something else.) But enlightened minds such as yours and mine are, indeed, up on such things as androgen excess and hypertrichosis, and we still think, Holy Cow, a bearded lady.